I think I have a huge obsession with velvet. No I don't think, I know!!!!! I love velvet-- all colors and in all styles of clothing. 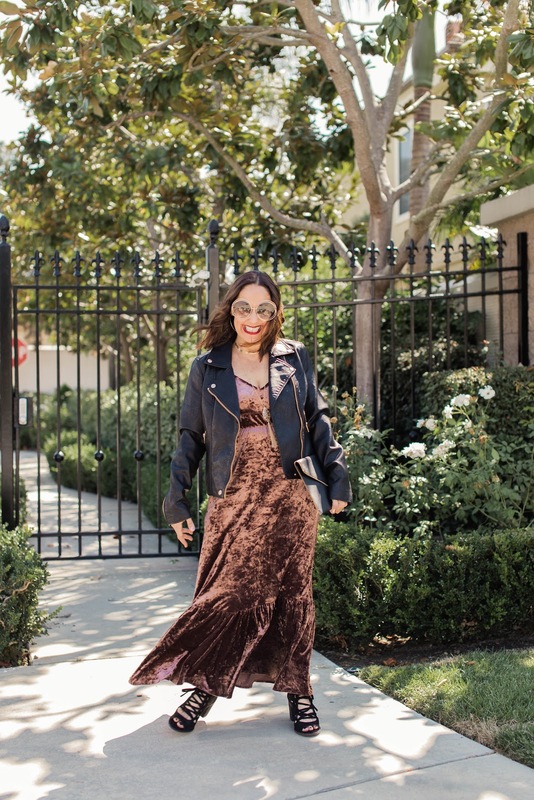 I love velvet tops, jackets, pants and dresses, like this adorable maxi from Holly Sharp Boutique. Can we talk about how amazing this color is for fall and winter? I paired this cute dress with my go to faux leather jacket (which you MUST have) and some open toed booties. I love layering a great jacket like this one over everything all year long. And I love the combination of these textures-- the softness of velvet meets the ruggedness of leather. I think it's a match made in heaven. I hope you invest in some velvet for this upcoming season, especially for the holidays. Thanks to Gabi Wells for photos. You can shop this look by clicking on the links above. Happy Reading!!!! !